1874 ½d Violet Postcard addressed to Plymouth showing a MANCHESTER "SLOPER" CLIP CANCELLATION at right. 1858 PEARSON HILL "OPERA GLASS" MACHINE CANCELLATION, Type 3 on entire prepaid from London to Nice, France - prepaid in manuscript. An unusual usage of this RARE Machine Cancellation. RPS Certificate. Superb! 1880 Postcard from Liverpool addressed to Sweden franked by a 1d Lilac, SG 172, tied by a very fine LIVERPOOL Boston-machine cancellation, Code 3 inverted. 1924 Cover to Greenwich, London from Australia and showing the ADELAIDE 'BRITISH EXHIBITION/ALWAYS ASK FOR/AUSTRALIAN PRODUCTS' Machine Cancellation. 1859 1d Pink Envelope addressed to Ireland cancelled by a very fine CHARLES RIDEOUT No 1 MACHINE CANCELLATION, 7 BARS ABOVE. 1871 SECOND-TYPE AZEMAR EXPERIMENTAL MACHINE CANCELLATION, 1d Rose-Red, SG 43, Plate 149, tied to Entire to Littlehampton, Code CB. 1898 BOSTON EXPERIMENTAL MACHINE CANCELLATION envelope, slightly reduced at left, addressed to Gravesend, franked by a ½d Vermilion, SG 197, and tied by a superb Boston Experimental Machine Cancellation. Very Scarce. 1886 Envelope to Michigan, USA, franked by a pair of 1d Lilac, SG 172 and a ½d Slate Blue, SG 187, tied by a superb CHARING CROSS W.C. HOSTER MACHINE CANCELLATION. Very Attractive. 1887 LONDON N.P.B (Newspaper Branch) HOSTER MACHINE CANCELLATION. Very fine, tying a ½d Slate Blue, SG 187 to Pink Wrapper addressed to Bordeaux. RARE. 1893 LONDON INTERNATIONAL TRIAL MACHINE CANCELLATION. A very fine example tying 1d Lilac to envelope addressed to Weedon. 1887 CHARING.CROSS S.W.C HOSTER MACHINE CANCELLATION. Very fine, cancelling a 1d Brown UPU Postcard addressed to Holland. 1886 LONDON ETHERIDGE TRIAL MACHINE CANCELLATION, very fine cancelling a 1d Brown UPU Postcard addressed to Belgium. 1902 LONDON INTERNATIONAL TRIAL CANCELLATION cancelling an Edward VII 1d Carmine Stationery Wrapper addressed to Penrith. SUPERB. 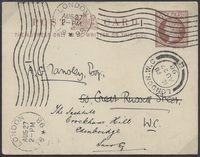 1912 Envelope to Felixstowe with, on the front, a very fine WILKINSON TRIAL MACHINE CANCELLATION "LONDON.E.C./1d/POSTAGE PAID/crown" in Red together with a London EC circular datestamp in black. 1885 2½d Lilac, SG 190, tied to Envelope to France by a superb LONDON/EC HOSTER MACHINE CANCELLATION. 1858 Circular Framed MONUMENT/LANE (Birmingham) CRESSWELL. RARE.